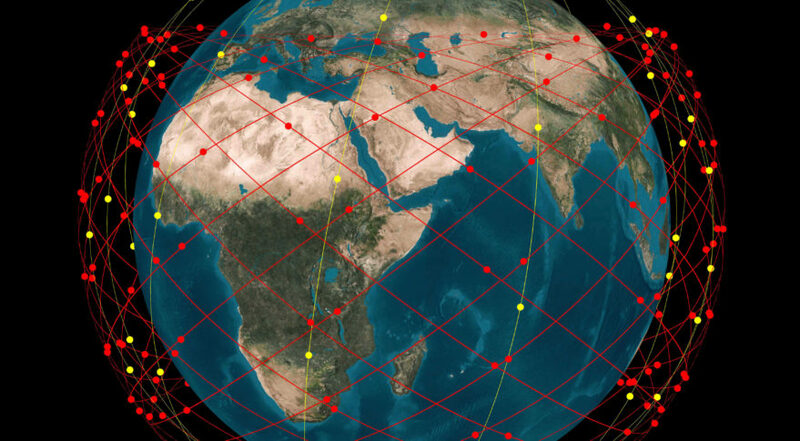 Telesat's LEO constellation is to consist of 120 small satellites. A manufacturer selection is planned for next year. Credit: Telesat. WASHINGTON — Telesat is some three to five months ahead of OneWeb in launching low-Earth orbit telecommunications satellites, and barring a surprise launch from SpaceX, will likely be the first new mega-constellation to put hardware into operation. Two prototype satellites ordered in April 2016 are awaiting launch before year’s end — one on a Russian Soyuz and another on an an Indian Polar Satellite Launch Vehicle — paving the way for a larger constellation of over 100 small satellites. Telesat LEO is the biggest satellite project the company has undertaken in its 50-year history. A conservative company even by satellite industry standards, Telesat holds its cards close ahead of most major moves. But that doesn’t mean it’s afraid to make them. A contract to build Telesat LEO is in the works, with a recipient expected next year. “We’re working with several leading satellite manufacturers and now have a constellation architecture that will allow us to meet our performance and cost targets with the scale and capacity to establish a compelling global business,” Erwin Hudson, vice president of Telesat LEO, told SpaceNews. 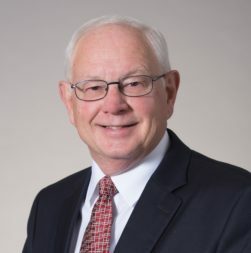 Hudson said Telesat has already thought through how to avoid stranding capacity over areas void of customers, has a system that will support both mechanical and electronically steered antennas, and argues that Telesat LEO will offer a lower-cost service than geostationary satellites. Telesat LEO has its sites aimed at virtually every internet connectivity market: mobility (airplanes, boats, and vehicles moving on rails or wheels) governments, corporate networks, and rural and remote broadband connectivity, including backhaul for cellular and internet service providers. With global priority Ka-band rights from the International Telecommunication Union for around 4 GHz of spectrum, Hudson said Telesat LEO will offer multiple terabits of total throughput once completed. Hudson, by email, answered questons from SpaceNews about Telesat LEO. Telesat has announced plans to launch two Phase 1 LEO satellites for testing and demonstration. What do you hope to accomplish in this part of your program? Our two Phase 1 LEO satellites will be launching later this year. One is being built by Surrey Satellite Technology Ltd. based in the U.K., a company within the Airbus Defence and Space group. It will be placed into LEO orbit using an ISRO Polar Satellite Launch Vehicle (PSLV). The second is being built by Space Systems Loral, partnering with the Space Flight Laboratory at the University of Toronto, and will be delivered to orbit on a Soyuz launcher. Erwin Hudson, vice president of Telesat LEO, joined the company in April, having previously worked for ViaSat, WildBlue, TRW Space & Electronics, and Space Systems Loral. Credit: Telesat. Phase 1 testing will focus on making sure the satellites and customer terminals are capable of tracking LEO satellite motion, compensating for the Doppler effects of a moving satellite, operating at the required elevation angles and delivering the high-quality, low-latency broadband experience that MEO and GEO satellites cannot achieve. We’ve already put ground infrastructure in place at our teleport in Allan Park in Canada so that we can start testing key performance parameters as soon as the satellite manufacturers complete their in-orbit check-out. In addition, many of our existing Telesat customers are really excited about the promise of Telesat LEO and will be participating in a range of tests on the Phase 1 satellites during 2018. Telesat LEO will have to compete with other terabit-capable satellite systems in geostationary, medium and low-Earth orbit. What’s Telesat’s advantage? Telesat LEO will deliver a broadband experience comparable to what users receive on high-performing fiber networks in their home or office. Not only will this be the most capable satellite constellation, but the cost per Mbps will be dramatically lower than current pricing. With high-capacity optical links between satellites, Telesat LEO will be a global mesh network capable of delivering fast broadband to both fixed and mobile customers, regardless of location. Advanced payload technology will allow our satellites to concentrate significantly more capacity over areas of high demand compared to other high throughput systems. As a result, Telesat LEO will be able to satisfy customer needs others cannot and efficiently serve, for example, dozens of aircraft near a busy airport, multiple cruise ships in port, or a military theater of operations. In addition, low latency is critical to high-speed Internet delivery and is another key Telesat advantage. Our LEO constellation will have approximately 0.03 to 0.05 seconds of round-trip latency, more than 10-times better than GEO satellites with typically 0.6 to 0.7 seconds of latency, including processing delays. MEO satellite systems are somewhat better than GEO but still have approximately seven-times higher latency than Telesat LEO. With faster and faster broadband speeds required to deliver today’s media-rich internet, and with a larger and larger fraction of encrypted traffic, low latency is becoming even more important to maximizing speed and delivering a superior web-based experience for end users. And with more and more services moving to the cloud, and the increase in latency-sensitive applications, providing low-latency, high-throughput broadband is critical. What will the constellation look like? Telesat’s initial LEO constellation will consist of around 120 high-technology satellites in two orbits — polar and inclined — and we are evaluating options to expand our system beyond the initial deployment. These satellites, combined with an advanced ground network, will enable full global coverage, with the ability to dynamically allocate capacity where it’s needed on a global basis. This advantage is central to our patent pending design. Telesat LEO will have far greater efficiency and flexibility than any other satellite system. The highly efficient nature of our constellation will result in our investment per Gbps of sellable capacity to be as low, or lower than, any existing or announced satellite system, whether in LEO, MEO or GEO. Individual links will have speeds in excess of 1 Gbps and the constellation will deliver multiple Tbps of total system capacity. Some industry officials have expressed concern that LEO-HTS could cannibalize GEO-FSS and possibly even GEO-HTS business. Where does Telesat net out on this? Telesat’s focus is the same as it’s always been: providing our customers with the best performing space-based systems to meet their changing communications requirements. The overall service quality, reliability and cost of Telesat’s LEO system will be unmatched by any GEO, MEO or other LEO system, filling a key gap in the global connectivity market. That’s why we are developing our LEO constellation. Other commercial considerations are really secondary. How will you prevent your constellation from stranding capacity over useless areas, like empty ocean and desert? Telesat’s patent-pending combination of polar and inclined orbits and inter-satellite links will be highly efficient in delivering multiple terabits of sellable capacity to our customers. We will also be able to dynamically allocate capacity where it’s needed on a global basis using advanced beam forming technology. We are confident that these capabilities along with other system features will provide outstanding service quality while meeting business case objectives. Some in our industry are concerned that user terminals will be the biggest weakness of LEO constellations. What is Telesat’s response to this? Telesat knows that our industry needs advances in ground terminals to fully take advantage of the capabilities of Telesat’s LEO constellation. We’re addressing this need in two ways. First, our LEO constellation will support both electronically steered and mechanically tracked antennas for serving fixed sites, air, maritime, ground vehicles and other platforms, both military and commercial. So our success is not dependent on a big leap in ground terminal performance and capabilities. Second, Telesat is in discussions with several companies, both well-established suppliers and new entrants that are developing next-generation electronically steered antennas. We are following their developments with the expectation that they will have high-performance, cost-effective products on the market in a few years. Telesat is confident that at least one, and more likely several, satellite antenna suppliers will achieve the improvements in cost and performance that the LEO satellite market requires. How will Telesat LEO manage to use mechanical antennas? A number of industry observers say the success of LEO systems hinges on electronically steered antennas. Won’t mechanical systems drive up prices? Will they be able to track multiple satellites at once, or just one? How long will a satellite be visible before passing over the horizon? Telesat is working with industry players to have a wide variety of terminals available for customers to access the Telesat LEO Constellation at the right performance and price targets, including electronically steered antennas (ESAs) and mechanically tracking antennas. Based on current industry developments, we expect our target customer base can be served initially by mechanically tracked antennas. The exact number of satellites in view of each customer will depend on multiple factors including geographic location, time and demand in neighboring areas. On average about three to seven satellites will be in line of sight within effective elevation angles. Where does Telesat stand in the satellite procurement process for its LEO system? Telesat is taking a rigorous requirements-based approach to the project, jointly developing a system architecture and a detailed business plan to be certain we clearly understand our costs, risks, schedule, capacity and revenues. We have both constellation performance models and global demand models that together allow us to evaluate the system’s capability to deliver high-quality service, when and where required, across the market segments we will serve. We are working closely with a number of engineering and manufacturing teams who continue to refine the system design. We expect to down-select to two competing teams and, after a technology evaluation and validation phase, we plan to commit to a single team in 2018. We plan to launch Phase 2 satellites beginning in 2020, and commence commercial service in 2021. How much will this all cost? What are Telesat’s funding plans at this stage? Given where we are in the procurement process, I cannot provide details on system costs but building and launching hundreds of satellites and associated ground infrastructure is certainly a big undertaking — bigger than procuring a couple of high throughput GEO satellites such as Telstar 18 Vantage and Telstar 19 Vantage that Telesat will launch next year. But while the capital costs are significant, keep in mind that Telesat has considerable financial resources and strong backing from our investors. We are also in discussions with potential partners — both strategic and financial — who are excited by our design, our Ka-band spectrum rights and our track record of successfully bringing major satellite innovations to market. So stay tuned — more details on Telesat LEO will be announced in the months ahead.